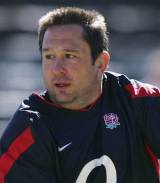 As a young Bath prop, the Canadian-born Yates won two caps on the England tour of Argentina in 1997. He was recalled as a Saracens player nearly ten years later for the tour to South Africa, appearing in both Tests. The gap between his appearance in Buenos Aires (2nd Test, June 7, 1997) and his next in Bloemfontein (1st Test, May 26, 2007) was a record nine years, 353 days. He also hit the headlines in 1998 when he was hit with a 6 month ban for biting the ear of London Scottish flanker Simon Fenn during their Tetley's Bitter Cup clash at The Rec that left his opponent requiring 25 stitches. As a result he withdrew from the England squad and later moved to New Zealand to play for Wellington and the Hurricanes becoming the first British player to be awarded a Super Rugby contract. He also helped Wellington to the National Provincial Championship crown in his second year. He returned to England with Sale in 2004 before a switch to Saracens in 2008. He currently plays Rugby Nice Côte d'Azur in the france's third-tier Fédérale 1.